Kimmy of “Kimmy and Julie :: Family Journal” had requested a craft on Christmas. He specifically wanted a Ginger Bread Man. So here it is, a Crafty Crafted version of the Ginger Bread Man. Cut a ginger bread man out of a thin cork sheet. Paste googly eyes on it. Trace the ginger bread man onto a white piece of paper. 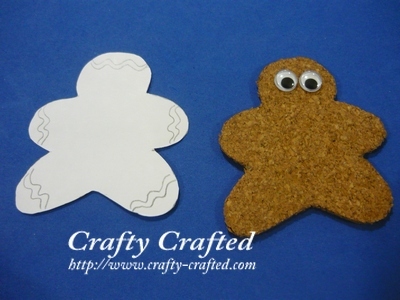 Cut out the strips as the 'icing' and glue them onto the ginger bread man. Paste the necessary decorations on the ginger bread man. You may run a thread through it to make a christmas tree ornament or paste a magnet at the back as a fridge magnet. so simple and cute! Ethan can be your assistant in no time..
Wow, that is really great….love it!